Chiropractic care is concerned with assessing the structure and function of your spine to determine the presence of misalignment which can drastically affect your health. The way we find these misalignments or subluxations is through X-rays, balance testing, and range of motion testing and palpation. Once we locate and find out the presence of these subluxations, we seek to correct those with chiropractic adjustments which will allow the nervous system to function at a higher level and enable the body to heal itself. During your first month of care, we will see you three times a week. Care is mainly related to relieving pain and restoring mobility. We find that most patients will have considerable improvement within that month. At that point Grace, our rehab specialist, will provide you with cervical ligament traction, a type of exercise. You will learn how to perform the exercise in the clinic, and you will eventually do it at home. Into your second month of care, you will receive muscle stretching and strengthening exercises that may include core and spinal exercises. 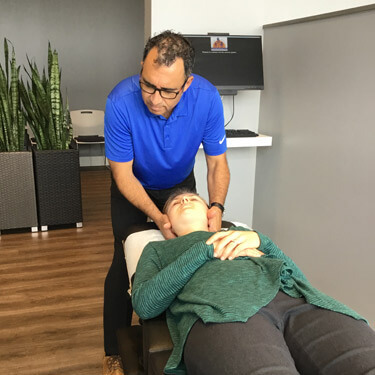 By the end of three months, most of our clients no longer have their symptoms and adjustments are usually down to once a week. At six months into your care, we will take the first comparative X-ray to see how the correction is happening and to what degree. After that period, most people will require only one adjustment a week. At the end of the year, we will do a second comparative X-ray to determine how much structural correction has happened. At that point we will determine if you need further corrective care or we will offer you wellness care to maintain your spinal health. If you’re ready to optimize your health and improve your life, we want to meet you. Contact us today to book an appointment!